Rosa has received some praise and lovin' over at the Scent Hive on this beauty filled Sun day. Please click on this link and read about natural body care items that spring from a bed of roses. 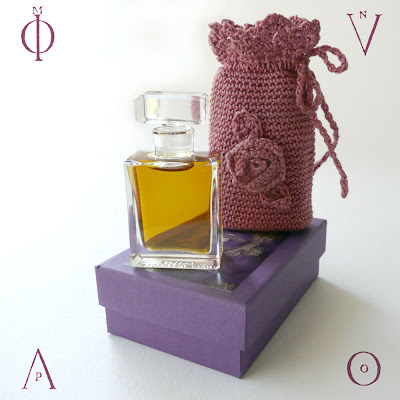 I took some photos of the Rosa flacon filled with the pure extrait and the pouch a few weeks ago. Above is one of the shots which I then took into photoshop and added an old black and white reproduction. The engraving is part of an image titled "The Sphere of Love", supposedly the symbols in the corners are letters which spell LOVE. Read more about Rosa and why I equate this perfume with "love" here at in this journal entry. In the quiet of the studio today I am working on several perfumes. The scent filling the space in this sacred moment is of the rich and heavenly Orchid flower, Vanilla.